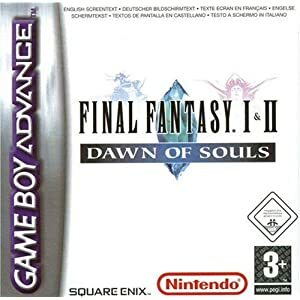 With the Final Fantasy series well into the teens in sequels, I was curious as to what the fuss was all about. Calling myself a gamer and having not played any Final Fantasy games tarnishes my reputation so I wanted to remedy that. For what it’s worth, I’ve played Dragon Warrior 1, 2, and 3 on NES, and Dragon Quest 4, 5, and 9 on DS. I haven’t played the NES games since my childhood so don’t expect any comparisons here. I’m also fully aware that the GBA remake is much easier than the original game. I’m assuming that the later Final Fantasy games have awesome character development; however, you won’t find that in the original game. Four prophesied heroes are brought together each bearing a dull crystal and the fate of the world in their hands. The four elements (water, air, fire, earth) are in danger of being corrupted by a dark power and it must be stopped at all costs. Before you embark on that journey there’s a princess to be rescued and some other side quests to help level you up along the way. When you first launch the game, you get to select and name your party members. I chose a Warrior, Monk, White Mage, and a Black Mage. Other classes include a Thief and a Red Mage. Each class is limited by what spells they can learn and by what weapons and armor they can equip. One nice feature added to this release is an option to optimize your character with the inventory you have in stock. Even though that system equipped my Monk with a weapon, I found that he fought better without one. Enemies are hidden and they are lurking outside of towns and inside of dungeons. The battles are completely random with the exception of boss battles which are triggered by stepping on key tiles. When in battle, you have the choice of attacking, using magic, using an item, equipping an item, or fleeing. If you win the battle you will get some money (Gil), experience, and occasionally some loot. After you gain enough experience you will level up and your attributes will increase automatically. The only character customization you have is by equipping them with weapons, armor, or spells. There are various helms, armor, robes, bands, knives, staffs, swords, hammers, wands, and axes to equip. Many of these items are sold at stores but the really good ones are found in caves and dungeons. Magic spells are sold in White or Black Mage shops and each town sells a few spells at a certain level. The real kicker is that a mage can only learn three spells for each level and there are often four spells available. 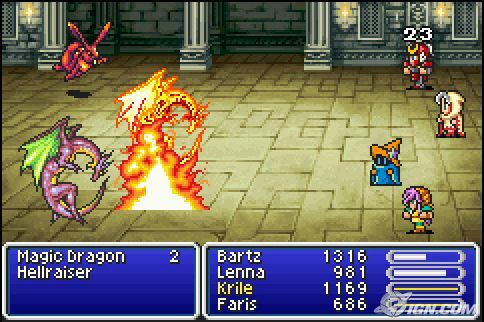 The White Mage is ideal for casting healing spells while the Black Mage focuses on elemental attack spells. Given that you’ll be fighting elemental enemies, they often have a weakness. These enemies often have nasty attacks that can poison you or turn you into stone. Make sure you visit the item shop and stock up on healing positions, antidotes, and golden needles to cure you from becoming a statue. Other items worth noting are the sleeping bags, tents, and cottages that can be set up to give you a place to rest and replenish your Hit Points (HP) and Magic Points (MP). Each town has an inn and the farther out you travel, the more expensive those inns get. Don’t worry though; money is not an issue later on in the game. At first it’s hard to come by, but soon you accumulate more than you can spend in a lifetime. So how do you get to these far away places? Your first acquisition is a boat that allows you to sail the ocean and discover new lands. Later, you’ll acquire a canoe that allows you to travel though rivers and waterfalls. The ultimate mode of transportation is the air ship. I love how the game perspective changes when you board that ship. It looks pretty neat for a 2D game. The graphics have been spruced up since the original game. The dungeon layouts have not changed, and there are new dungeons added to the GBA re-release. Each dungeon is available after you beat an elemental boss. There are lots of unique monsters and lots of different colored variants. For example, a Purple Worm is completely different than a Brown Sand Worm. The music composed by Nobuo Uematsu is where Final Fantasy really shines. The towns, shops, caves, and battles have the same music throughout the game. However, some areas, like The Floating Castle and Chaos Shrine have their own unique music. The last battle has a dedicated song too. The sound effects are decent but I was often listening to the music instead. If you like classic Role Playing Games, Final Fantasy is worth looking into. I spent close to twenty hours playing the Dawn of Souls remake. I only ventured into one of the optional dungeons. Had I went into the other three I could have easily spent a few more hours playing the game. The only appropriateness issues I saw were fantasy violence and magic being used. If you don’t mind those elements, make sure you add this game to your bucket list!